First, it was Advanced Semiconductor Engineering embroiled in a wastewater dumping scandal. Then, a TransAsia Airways plane crashed after aborting a landing in Penghu, and most recently pipelines used by LCY Chemical to transport propylene in Kaohsiung leaked, triggering explosions that killed 30 people and left more than 300 injured. All of these incidents, which seriously tarnished the reputations of the companies involved, may have been caused by simple mistakes in judgment or lapses in procedures, but Tunghai University Accounting Department professor Hsu En-te thinks they all originated in the boardroom. "None of these were only the responsibility of a single environmental, safety and health division or purchasing department. They all were related to the decision-making responsibility of the companies' CEOs," Hsu contends. He was not impressed by the protestations of innocence by the companies' leaders or claims they were not aware of the situation. "Setting clear strategies and precise operational indicators is the main responsibility of corporate governance," he says. So it comes as no surprise that "corporate governance" is the theme of a new addition this year to the CommonWealth Magazine Corporate Citizenship Awards – an "Annual Theme Award." "Corporate governance, simply put, is about integrity. When you have a culture of integrity, you naturally won't violate laws and regulations," says Lenyu Liu, CEO of National Chengchi University's Center for Corporate Governance. The United States-based non-profit organization B Lab has aggressively promoted CSR (Corporate Social Responsibility) certification in recent years to redefine what it means to be a "successful company" in today's world. B Lab measures a company's success not only by profitability but also by the value it creates for the environment and society. That was also the intention behind establishing the CommonWealth Corporate Citizenship Awards in 2007. 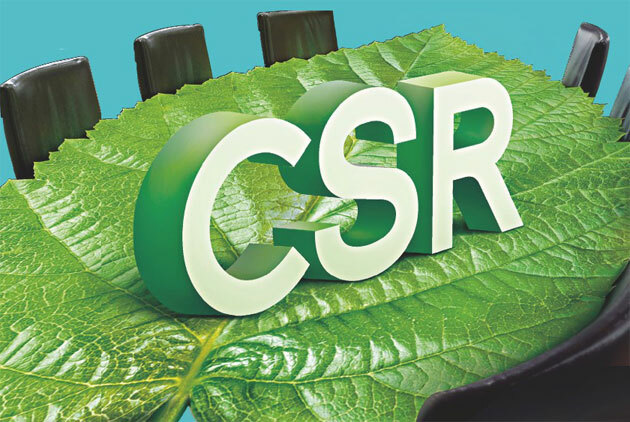 In the eight years since, the awards have reflected the deteriorating environment and the difficulty of sustaining CSR practices, with only 12 companies appearing in the rankings every year over that time. All 12 are widely recognized for the sustainability of their operations. Nine are large-scale companies – Taiwan Semiconductor Manufacturing Company (ranked first in this year's corporate citizenship rankings for large-scale enterprises), Delta Electronics Inc. (second), E.Sun Financial Holding Co. (third), Sinyi Realty Inc. (fourth), Compal Electronics Inc. (fifth), Chunghwa Telecom (sixth), Fubon Financial Holding Co. (10th), Taiwan Mobile Co. (11th) and Hiwin Technologies Corp. (29th). 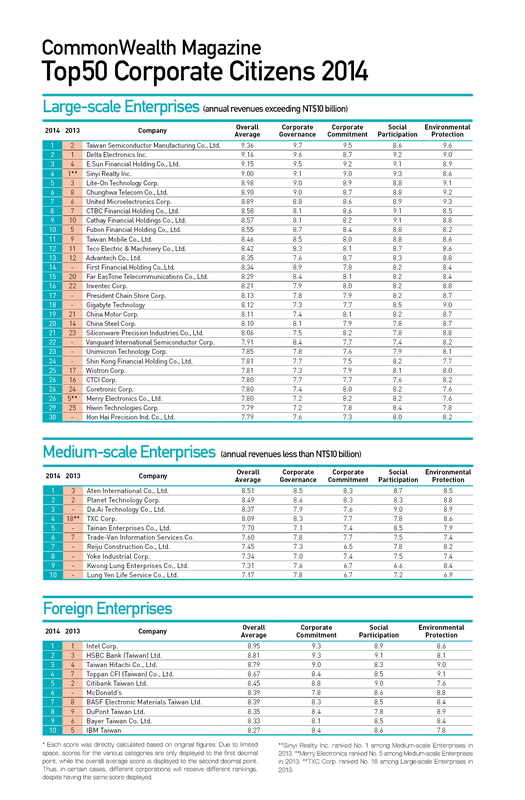 Only one medium-scale enterprise – Planet Technology Corp. (second) – and two foreign enterprises – Citibank Taiwan (fifth) and Dupont Taiwan Ltd. (eighth) – have had unabated runs of success in their respective categories. TSMC was not only this year's overall corporate citizenship award winner among large-scale enterprises, but also received the annual theme award for corporate governance. Foreign institutional investors, who hold 76 percent of TSMC's shares, have favored the stock not only because of the company's international competitiveness, but also because of the integrity, transparency and professionalism of its corporate governance. "The composition of TSMC's board of directors is both diverse and highly specialized, resulting in high quality decisions," says Albert Hsueh, chairman of the PricewaterhouseCoopers Education Foundation. "Also, investor relations information is disclosed concisely and completely. (Disclosure) is not treated as a mere formality." Following closely behind TSMC was Delta Electronics. "Saying that CSR is simply about spending money is a complete misconception," says Delta Electronics chairman Yancey Hai. The company, which started out as a power supply specialist and to this day remains a leader in the field, has always strived to reduce its products' energy consumption, helping to create value for its customers, protect the environment and ultimately strengthen the company's bottom line. At its investor conference on July 29, Delta Electronics announced a gross margin for the second quarter of 27.43 percent, a record high for the company that stunned those in attendance. Investors who purchased Delta Electronics shares in 2004 would have earned a return of 600 percent as of the end of last year, a clear example of how shareholders benefit when CSR forges a company's future values. According to Frank Wang, the president of Athena Capital Management and a former strategy analyst at Morgan Stanley, CSR quantifies "universal values" and enables investors to differentiate between more and less desirable companies. "In the face of competition from Chinese enterprises, Taiwanese enterprises can no longer compete on scale or price. They have to depend on CSR to widen their lead," Wang says. There are outstanding models of corporate governance among mid-sized companies as well. Over the past eight years, CSR stalwarts Sinyi Realty and Hiwin Technologies have made the transition from mid-sized enterprise to large-scale enterprise with annual revenues exceeding NT$10 billion. Their evolution confirms the complementary attributes of CSR and business performance. Merry Electronics Co. (24th), which also puts a priority on corporate governance, cracked the large-scale enterprise category this year after nearly 40 years. "Who really needs CSR and corporate governance the most? It's not big companies. It's medium-sized enterprises," insists Soushan Wu, the chairman of Gretai Securities Market, which runs Taiwan's over-the-counter and emerging markets. Wu believes that a company's growth in scale is usually decided at its inception, arguing that if it does not think about sound corporate governance practices from the beginning and does not embrace CSR concepts, it can easily falter prematurely as it grows bigger. Deloitte Taiwan CEO Clark Chen suggests that at the same time as companies stress legal compliance, they should also carry out long-term strategic plans from the top down that encompass the company's vision and philosophy. Planet Technology, which has ranked among the top 10 medium-scale enterprises in corporate governance for eight consecutive years and celebrated its 20th anniversary in 2013, was one company that made sure to get off to a good start. Aside from focusing on developing high-performance networking products, Planet Technology chairman Jack Chen has been just as eager to forge a CSR culture within the company. From sponsoring organic tea farms in Pinglin to recycling medicine and used batteries, Chen has aimed at "starting with places we can reach out and touch," because if the benefits do not have an impact, then CSR is nothing more than a slogan. When asked what advantages CSR brought to a company that was still relatively small, Chen thought about it and then had to admit, "I can't cite any substantive benefits." But he firmly believes that "(CSR) is a key link in shaping an outstanding corporate culture, offering intangible assets that money can't buy." In this year's Corporate Citizenship Awards, CommonWealth Magazine went beyond adding an "Annual Theme Award" (corporate governance), and decided to also launch "Progress Awards" and "New Star Awards." This year's "Progress Awards" identified companies that have seen a steady rise in their CSR performances. The winners were Far EasTone Telecommunications Co. (15th) and Inventec Corp. (16th) in the large-scale enterprise category and Toppan CFI (fourth) in the foreign enterprise category. The award showcases more than just the companies' determination to pursue CSR. It also highlights the innovative methods they used in upgrading their performances, methods worthy of emulation by their peers. The "New Star Award" goes to companies that registered to participate in the evaluation process for the first time and were rated highly enough to make it into the rankings of their respective categories. Gigabyte Technology (18th), Unimicron Technology Corp. (23rd) and Hon Hai Precision Industry Co. (30th) were the only large-scale enterprises to crack the rankings for the first time. Da.Ai Technology Co. (third), Reiju Construction Co. (seventh), Yoke Industrial Corp. (eighth), Kwong Lung Enterprises Co. (ninth) and Lung Yen Life Service Co. (10th) were all newcomers in the medium-scale enterprise category. Small and medium-sized enterprises are the backbone of Taiwan's economy, and the surge in newcomers in the smaller company division has given rise to expectations that this group of budding companies can play a leadership role in the field. One other company worth mentioning is state-run financial services group First Financial Holding Co. (14th). First Financial Holdings' strong showing proves that traditionally conservative state-run financial institutions can successfully align themselves with the forward-thinking CSR wave just as well as their private sector rivals. National Chengchi University's Liu says First Financial Holdings chairman Tsai Ching-nain has been praised by outside observers for his respect for independent board directors, a key element of corporate governance. Also, in 2014, First Financial Holdings' banking unit First Bank adopted the "equator principles," a risk management framework that has established a credit blacklist mechanism to reject loan requests by companies blacklisted for records of environmental or labor-management disputes. Regrettably, other state-run financial institutions have either preferred to remain conservative or low-profile or have taken only slow and unfocused CSR steps, leaving plenty of room for improvement. It will be interesting to see if First Financial Holdings can inspire lagging rivals and other state-run enterprises to get on the CSR bandwagon. Though the outcomes vary greatly, there can often be a fine line between a company creating social problems or solving them, and between explosive short-lived growth and sustainable development. The side of the fine line a company ends up on may ultimately be decided by its corporate governance and CSR practices.